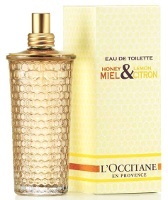 L'Occitane's latest fragrance release is Honey & Lemon / Miel & Citron. I am not sure if it is meant to replace their Honey Gentle Water, which I've heard is slated for discontinuation (just repeating a rumor, mind you, so take with a grain of salt). I know I've smelled the Honey Gentle Water, which is a favorite of many, but I hardly remember it. From what I do remember, it was a very soft honeyed floral, more like a body spray than a perfume. The new Honey & Lemon is something else altogether, assuming my memory is at all on target. Honey and lemon are both present and accounted for; the honey is soft, the lemon is candied and nicely tart. But what Honey & Lemon is about, as much as anything, is vanilla and patchouli. This is a soft, vanillic gourmand, not too sweet and not at all heavy, with just a little wisp of lemon remaining past the top notes. The patchouli is very clean — there is hardly any earthiness to speak of — and there is a bit of sheer floral and musky woods. I don't think it isn't likely to strike anyone as massively unique, but it is nice, and it will be in a whole range of body products (hand cream, body cream, shower gel, lip gloss, soap, sugar scrub) that might be worth checking out. L'Occitane Honey & Lemon is available in 100 ml Eau de Toilette, and is $42. The lasting power, as is often the case for L'Occitane, is so-so. For buying information, see the listing for L'Occitane under Perfume Houses. I still haven't tried any of the new Notre Flore fragrances from L'Occitane, please comment if you have! The EdT isn't in Vancouver yet, but they were giving away samples of the body cream and it smells really, really good! “Nice” is the word, in the best sense — someting you'd love to slather yourself with before getting into cozy pjs on a cold fall evening when you want to dream of sunny Provence! Aha, will have to try the body things, thanks! Well, not everything needs to be Da Vinci. This sounds rather nice, even if it's less honey than I'd hoped for. The honey gentle water is very honey-ish without any of the funky bits, which is why it's nice for little kids. And I like it too. I will be sad to see it go, if it does. I am still mourning the loss of their shea fig stuff. This new addition sounds wonderful, but I'd still be extremely sad to see the Gentle Honey Water go. Both my kids and I loved this stuff. (Just as I am posting this, my youngest exclaimed how upset she is about this!). Hmm, no 20ml size in this one either, eh? I find the lasting power of the jasmine note in L'O's Green Tea to be very long, even in the smallest doses. It's almost too sweet for me. It sounds very, very appealing! Well, then hopefully it is really just a rumor — I honestly don't know for sure. M, it is a simple little thing, but yes, appealing. I love the honeycomb bottle, but I simply can not do vanilla, so I hope they will not be replacing their entire honey line with this scent. I especially like the little hexagonal soaps with bees on them! The Notre Flore scents are utterly uneventful. I was so bored that I turned around and left without even browsing the rest of the shop. That Honey and Lemon bottle reminds me of Guerlain's refillable EDT atomizers! I tried three of the new L'Occitane fragrances today. The Iris is simple and pleasant, a soft, non-rooty iris. The Myrtle is almost lemony, a very clean-fresh floral, and has weirdly strong staying power. The Neroli only has neroli topnotes, to my nose, then dries down into a sweet amber-vanilla blend. The stores are doing a good deal right now: you get a gold travel pouch and a purse-spray with your purchase of a full size bottle. Will keep my fingers crossed for you then, as I doubt you'll like this new one. Ugh, really, that dull? Drat. I work for L'Occitane. We haven't got the edt in our store yet, and the campaign doesn't officially start until Wednesday – lucky you, we haven't even had a chance to smell it. Anyway, the existing Honey line is being phased out and replaced by Honey & Lemon. Current Honey products will start disappearing as we sell through them. Thanks, I sort of figured they would phase out the old. Too bad though! Bonus: Lemon and Honey lasts a staggeringly long time! Sorry for been out of topic…, did you (or somebody) try their Eau d'Iparie? It's my favorite of L'Occitane's. I'd be very thankful to read review about it and/or some comments. I have not tried Iparie, sorry! I was surprised when I tried this one thinking that I wore the wrong fragrance. i lkept looking for Honey and Vanilla which was all i smelled, yet all i was holding was Honey & Lemon. I DID find it nice, and soft, but where was the honey? and lemon? i liked it as a vanilla fragrance – but i found it strange that they called this scent one thing, when all it was, was entirely different notes. Yes, wish they’d rename this one and do a REAL honey & lemon! I like it, but wearable honey scents are few & far between.